The last day of Me Made May was cold, rainy and windy, here in London: the worst weather of the whole month. Never mind, I got to wear my new Surry Hills Cardi, denim Pilvi coat and bobble scarf. How did My Me Made May Resolutions Hold Up? I wore something Me Made everyday. Even the days I was sick, I wore a me made nightgown. I brought into rotation some clothes that I wasn’t confident about. Some of these, like my Tina Givens Prairie dresses may get retired, while others, like my African print jacket and circle skirt have rejoined my wardrobe. I also have a few alterations to perform to get more life out of other items like my blue dress. I Documented every day of the month with a photo. I got a lot more comfortable with photos of myself. So comfortable, that I am taking pictures in changing rooms and all over the place. I also really enjoyed looking at photos of other real women, looking fabulous. I found lots of inspiration on Instagram. I was particularly interested in seeing mature women with individual style. I made new sewing friends and encouraged others in their sewing and showing via social media. I was particularly active on Instagram. I made some really good connections and will continue to follow and communicate with my new friends. I made 7 new garments for myself: pom pom infinity scarf, check top (I don’t think this one is a keeper though), denim Pilvi coat, blister cotton tunic, washi dress, floral linen dress and White Surry Hills cardigan. I also revamped an old kimono and altered some jeans to fit. There were some items I wore this month that I have evaluated differently now that I have seen pictures of myself. Anything that is oversized in the upper body, just doesn’t make me feel good. I want more washi dresses and short jackets. In terms of sewing impact, I can’t beat my two new Pilvi coats and my three handmade bags. These items really pepped up my wardrobe. I need more coats, particularly for bad weather. These are on my to do list. There will also be more special bags in my future. I will evaluate what mood I want to create with them in the autumn. You’ve inspired us all! Thank you for sharing your beautiful memade clothing and body con insights. 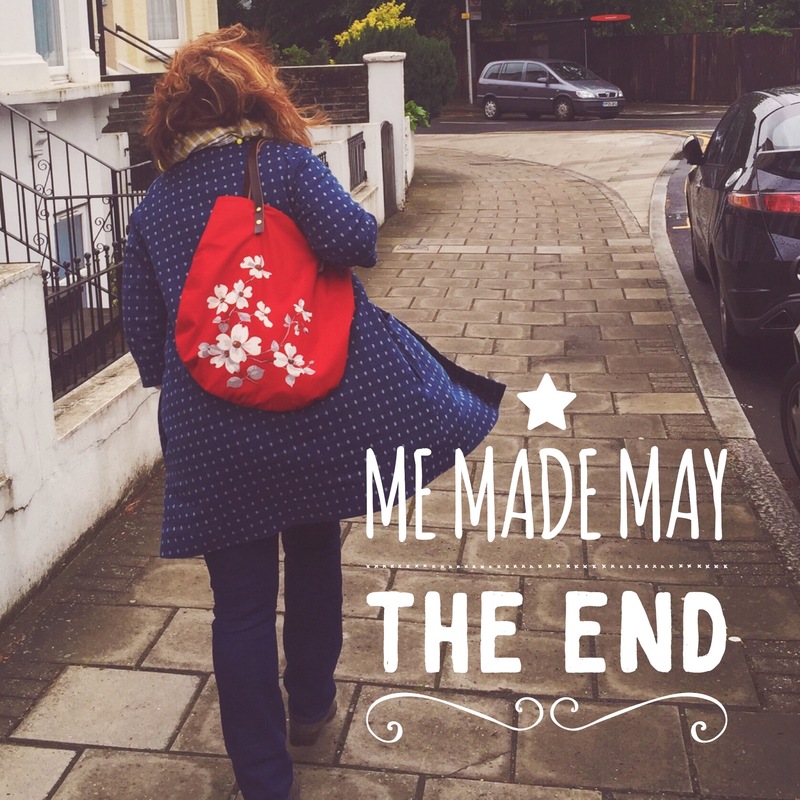 I have loved seeing all of your me-mades through May, I don’t have near enough to join it yet but it has inspired me to keep going and keep learning. You could join in with the occasional me made Monday. #mmmonday Build up your confidence. I have looked forward to your photos on instagram each day and love love love your style. You may worry about selfies but I just see a talented confident woman who has a zest for life and a confident style! You have inspired me to buy some fabric and start sewing again after many years of neglecting my sewing machine! Thank you Sandra. That’s great to hear! I am feeling much more confident about selfies. The best thing to hear though, is that I inspired you to sew. What is your Instagram handle. DM me on Insta, if you don’t want to say her.